Throughout Latin America, people are opposing a model that destroys the environment and limits the possibilities for communities to continue cultivating the land and living the way they choose. 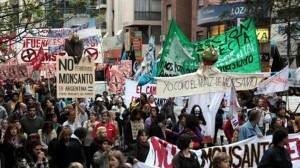 Conflicts over mining, fumigations, and genetically modified organisms are among the most frequent. via Latin America Rejects the Extractive Model in the Streets. I’ve been wondering what a sustainable, ecological industrial process might look like. Of course, recycling as much as possible is key, but I think we would still need virgin material especially for a growing population. I have been wondering if we couldn’t apply some of the same (or possibly new) chemical extraction processes organic material. Plants are used in bioremediation. The dangerous metals are concentrated in their stems, leaves, etc. if the plants were decomposed in a digester could we then precipitate out the material that we would normally grind up tonnes of rock to retrieve? That’s a really interesting idea. I have no idea if that’s possible. I tend to lean towards sustainable and ecological being antithetical to industrial, but I’m open to being proven wrong.